Is Topps Bringing Back Stadium Club Baseball? The last Stadium Club Baseball set was released in 2008. A high hobby price, confusing numbering and a lack of pop contributed to its struggles. When it debuted in 1991, Stadium Club was an instant hit. Strong photography became a hallmark for the then high-end brand, which was also originally printed on Kodak paper. But as the hobby evolved, the brand lost a lot of its excitement. Topps tried different things, but by the time the new millennium rolled around, it had lost a lot of its identity. While the first revamp in 2008 brought back the photography focus, it too got lost in the shuffle. Hobby packs, which promised a hit, were $25. Not helping matters was the fact that there weren't a lot of strong signers. With the emergence of Evan Longoria and Clayton Kershaw, it's a little better but it's still tough to justify the high cost. The set failed and Stadium Club was re-retired. 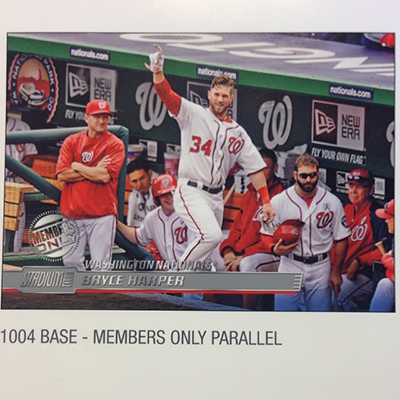 Topps hasn't released any details for 2014 Stadium Club Baseball yet. It's possible it might just be an insert. Are you excited for the return of Stadium Club? What are you hoping for if it is a set once again? Bring it! Make it retro ala 1991, as retro seems to be the new way to go. Do not use crazy numbering or an insane amount of inserts, variables, etc. Make it what it once was, the base cards brought the excitement. And please no insane price point. If Stadium Club is going to be a set, I would like to see Topps borrow a similar idea from 2012-13 Panini Prizm Basketball. Not for the look, but for the content. A good base set with mostly current players, lots of rookies and some retired superstars….a couple of non #’d parallels(like the Prizm refractors and Greens) that look great but are not necessarily easy to pull…a low #’d parallel(again like the Gold/10)….a couple of well designed inserts with popular players and then the autographs. Basketball collectors seemed to have loved this approach. Make it about photography… digital photography gives Topps a lot of options… all they have to do is browse the MLB photography store for ideas.� Inserts should be built around photography too… something like a themed insert like “sliding stars” in Gypsy Queen. Make hits rare (like 2008 Upper Deck OPC)… these should be classy cards that you would rather display than sell on ebay.�I would avoid including retired players this time.�It would be a treat if they use an unpublished photo or outtake but Topps seems to use the same stock photos over and over again. Recycling the same photo of Willie Stargell getting a hit in Wrigley Field for the 46th time for a “new” set doesn’t exite me.